The mass flowmeter also complies with American Petroleum Institute (API) and American Gas Association (AGA) guidelines. The OPTIMASS 2000 S400 16 inch Coriolis mass flowmeter by Krohne, Inc. features the highest flow capacity of any Coriolis meter. The large diameter mass flowmeter can be used for bulk measurement of petroleum and oil, as well as syrup, molasses and raw chemicals. 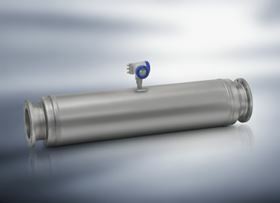 With its four straight tube design, the OPTIMASS 2000 S400 has a small installation footprint and could offer significant energy savings with a lower pressure drop. The meter’s small installation footprint makes it suitable for applications where space is limited, like offshore platforms, or where alterations of existing pipework would otherwise be necessary. Able to handle flow rates as high as 4,600 tons per hour, the OPTIMASS 2000 S400 features an accuracy of 0.1% with a turndown of 20:1, and an optional 0.05% “flat” accuracy with a turndown of 10:1. The high turndown ratios keep flow velocities low, preventing build up or deposits in hydrocarbon applications.